Wednesday on Lubbock's First News, Joan Lunden, host of Good Morning America for seventeen years, talked with Tom and Laura about the changing values and methods in journalism over the years. The National Law Enforcement and Firefighters Children's Foundation (NLEAFCF) raised nearly $500,000 at its its inaugural Hero Awards Gala on Monday, September 23, 2013 at the Edison Ballroom in New York City. We're all about products that make dinner prep easier. So we were intrigued by a new line of cookware called Twiztt by Joan Lunden. Your kids are going off to college or moving out to their first apartment. They've ransacked your basement and kitchen for hand-me-downs, but there is still something missing. Joan Lunden is well known for being the queen of the morning airwaves, but how does this mother of 7, (with four all under the age of 10), sleep at night! Yep. That's what we said; Twiztt. It's a new and innovative cookware line by TV journalist and health advocate Joan Lunden. And we're told it's already a hit. Deborah Keys was recently selected to win a "Rest and Recharge" Caregiver vacation from Joan Lunden, former host of Good Morning America. This one is really important to us. Today's Caregiver magazine is 18 years old now, so we were around when Medicare Part D rolled out. Do you dream of being a kid again for a few days and re-living your summers at sleep away camp? 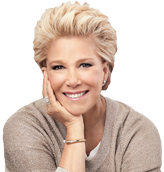 Memory foam bedding manufacturer Sinomax USA and former Good Morning America host Joan Lunden will launch a new line product line called Awaken later this month. A National Lutheran Community (TVOR) commemorated their community-wide Grand Opening Celebration on Monday, June 17 with caregiving and wellness advocate Joan Lunden and approximately 700 guests. At 62, the poised and radiant Joan Lunden is still very much a blonde, yet she intimately understands the graying of America. Award-winning journalist and author Joan Lunden and I met recently to talk about eldercare issues. The author and former TV news host, whose mother is 94, talks about taking care of aging parents and managing their prescriptions. Howard Dean, Ken Burns, Wally Lamb, and other natives or adopted New Englanders on their favorite summertime pursuits. Over 31 million Americans are enrolled in Medicare Part D but half of those enrollees are unaware of the savings they could be benefiting from if they understood their medical plans better. As both a caregiver to my 94-year old mom, Gladyce, and a mother of seven, Mother's Day is a holiday that I cherish with my family. Joan talks to KOMO news about caring for her mother and caregiving across America.